Maxime Guyon was born in the town of Laval, Mayenne, North West France. 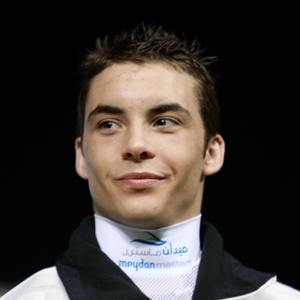 His family had little connection with racing, although his mother worked in a PMU bar-tabac. He started out riding on the pony-racing circuit before studying at Le Moulin a Vent jockey school in Gouvieux and going on to finish his apprenticeship with legendary French trainer, Andre Fabre. Guyon first came to the attention of British racegoers when winning the Group 1 Prince Of Wales’s Stakes at Royal Ascot in 2010 on Byword, which was also his first winner in Britain on his first ride. He finished a close third on Restiadargent in the 2012 Diamond Jubilee Stakes, race three in the Sprint division of the QIPCO British Champions Series, just behind the brilliant Black Caviar and Moonlight Cloud. He won three Group 1 races in Europe in 2013, most notably the Juddmonte Grand Prix de Paris aboard Flintshire, and started 2014 in style winning his first British Classic aboard Miss France in the QIPCO 1000 Guineas. Next he was second on Flintshire in the Investec Coronation Cup. In 2015, he partnered Solow to three Group 1 successes in the Queen Anne Stakes at Royal Ascot, the Qatar Sussex Stakes at Goodwood and the Queen Elizabeth II Stakes Sponsored by QIPCO on British Champions Day.